Magis Summer 2018: With Saint Philippine, let's cross our frontiers! With Saint Philippine, let's cross our frontiers! You may have heard from others about these 15 days with Philippine, a week of sharing of experiences and of pilgrimage. All went very well, and it has been a time of intense sharing of experiences. We had a beautiful celebration at Grâne, which was attended by Mr. Estrangin (a member of Philippine’s family who has renovated the Grâne property and lives there) and Father Raymond Peret who has written a little book on Philippine. The group was very international. 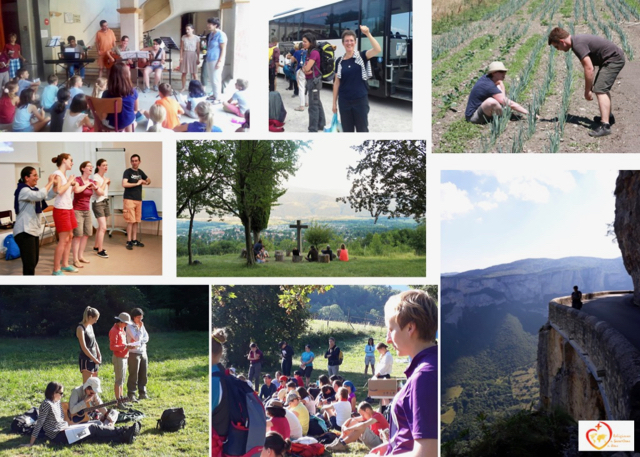 There were rscj, young people, women religious of other congregations, and Jesuits, coming from Hungary (20), Poland (20), Romania, Spain (4), Luxembourg (1), Switzerland (1), Egypt (4), Madagascar (1), Belgium (5) and France. There were even two young women from the USA, one of whom is to be in charge of pastoral care in a Sacred Heart institution. Click here to read Sophie's full account with photos of this 15-day experience.